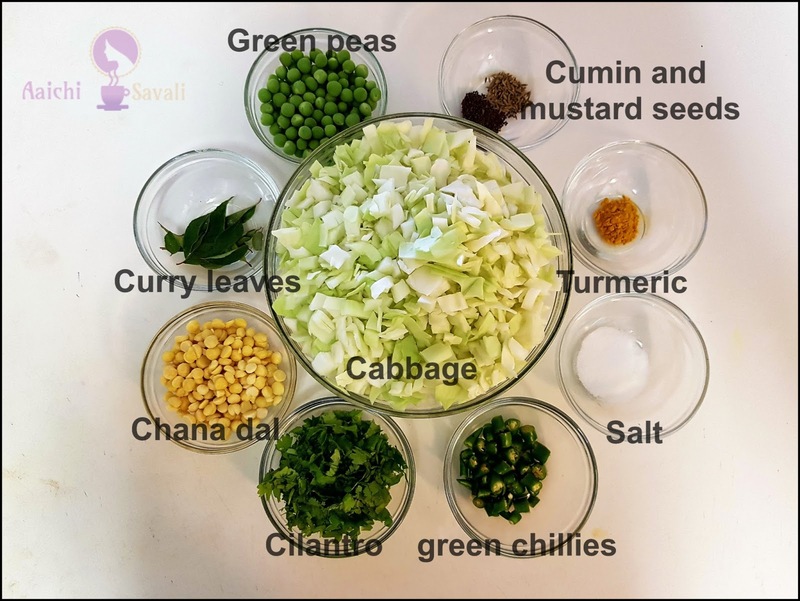 How to prepare non-sticky, vegan Cabbage sabzi. recipe to go with rice or chapathi. It’s rich in antioxidants, vitamin C, and other essential vitamins. And at only 22 calories per cup, you can pretty much eat all you want. Cabbage can be used in a variety of Indian food recipes like paratha, curry, stir-fry, raita, salad, and kofta, much more. 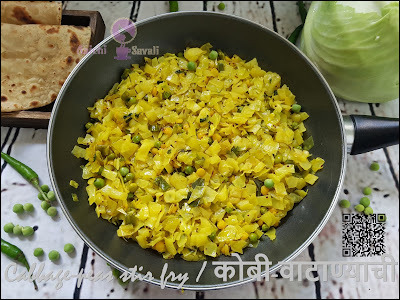 This cabbage matar stir-fry recipe is a good addition to the daily lunch and dinner menu since it is healthy, simple, quick to make and tastes delicious. It also goes well with tiffin box. In Indian cuisine, there are many healthy, quick and tasty vegetable recipes that are super-easy to make. This Indian-style stir-fried cabbage, chana dal, and green peas recipe are one of them. This is a great accompaniment to chapati, rice, and dal. Savoy cabbage is a green cabbage with very crinkly textured leaves. It is more tender, and I think it has a better taste than the smooth-leaved green cabbage. Preparation Time : 5 Minutes ; Cooking Time :15 Minutes. Each Serving Contains 99.5 kcal. Cabbage ½ head, medium (500g), chopped. Wash and cut cabbage and keep aside. Heat oil in a pan and once oil get hot add cumin and mustard seeds, curry leaves, asafoetida powder and green chillies. Cook till the green chillies are a little soft and add green peas, chana dal, saute well for a minute or two. Now add cabbage, salt and turmeric powder, saute and mix all well. Cook, covered over medium flame till the consistency which you like your cabbage to be cooked, stir frequently. (I have cooked it for about 10 minutes). Add chopped cilantro. Serve with chapati, roti or with phulka. Here, crunchy, non sticky and healthy cabbage fry is ready to serve, serve hot with chapati or bhakri. Enjoy!!! Per serving contains 99.5 calories, along with carbohydrates - 12.93 g, dietary fibers - 4.82 g, fats - 4 41 g, proteins - 4.5 g.
Eating a ½ cup of cooked cabbage would provide more than one-third of your vitamin C needs for the day. Also helps to protect from radiation therapy. Heart - It also helps to reduce the risk of cardiovascular disease by preventing platelet buildup and reducing blood pressure. Digestion - The fiber and water content in cabbage also help to prevent constipation and maintain a healthy digestive tract. Weight loss - With only 33 calories per cup, cooked cabbage is low in fat and high in fiber. It is definitely a smart carb. It is a brain food. Cabbage is full of vitamin K and anthocyanins that help with mental function and concentration. These nutrients also prevent nerve damage, improving your defense against Alzheimer’s disease, and dementia. Detoxify body - It helps to detoxify the body. The high content of vitamin C and sulphur in cabbage removes toxins (free radicals and uric acid). These are the main causes of arthritis, skin diseases, rheumatism and gout. Anti-inflammatory properties : cabbage is rich in sulphur. So, it helps fight infections in wounds and reduces the frequency and severity of ulcers. It is good to eat cabbage peas stir fry for lunch and for dinner. Nice and simple recipe. I will try it. 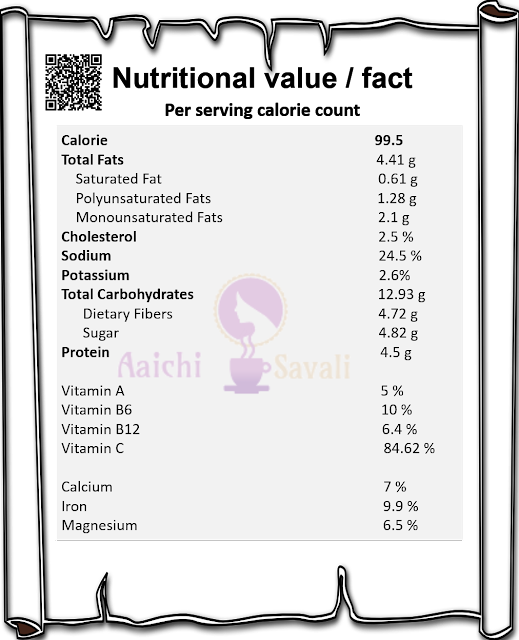 Adding chana dal and curry patta,will give a different twist to the flavor, as these ingredients are not used in North Indian cooking. Thank you for stopping by. Yes it is simple and healthy Recipe. Great to know you liked it. Well this looks super delicious!